Publication Information: Thomas Dunne Books. 2018. 336 pages. Opening Sentence: "Alice washed her hands in the kitchen sink, looked out the window, and smiled." Favorite Quote: "Life is divided into shadow and light ... You can see it either way, based on your own perspective ... Based on your own light level." Sometimes, I just need a feel good book that reminds me of the priorities in life and the bonds of family. This is one of those books. Since I love to cook, an added bonus is the fact that it is also a foodie book centered around a recipe box passed down from generation to generation. The plot of the book is a simple and predictable one. Samantha "Sam" Mullin grows up in a strong and loving family with multiple generations on her family farm in northern Michigan. As is often the case, her struggle is the pull of family tradition and a need to define herself separately and distinctly from that heritage. So, she leaves the family business to seek education and a career as a chef . Circumstances come together to bring her home again. Part of Sam's story, as you might expect, is a love story - sweet and predictable. 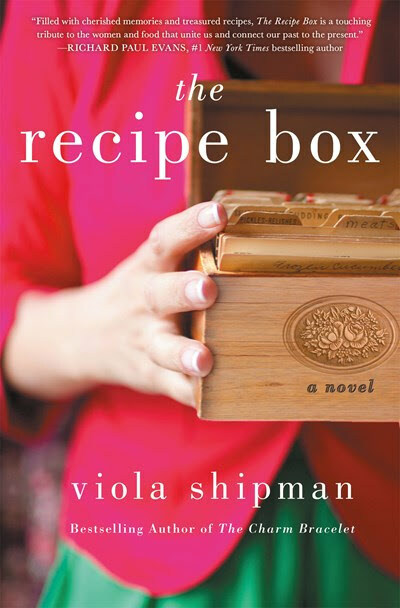 Surrounding Sam's story is the story of the recipe box and the generations of strong women who have both contributed to and worked with the recipes in the box. The book weaves in their stories and their choices through vignettes and flashbacks. These women's are both Sam's anchors and the ones who give her courage to find her own path. As the author's note states, "The book is a tribute to our elders, especially the women in our lives whose voices were often overlooked in their lifetimes." Anchoring each section of the book is a recipe from the recipe box with smells and flavors that rise up from the page. The recipes include apple crisp, peach-blueberry slab pie, cider donuts, cherry chip cake, triple berry galette, thumbprint cookies, ice cream sandwiches with maple spice chocolate chip cherry chunk cookies, the perfect pie crust, strawberry shortcakes, rhubarb sour cream coffee cake, apple and cherry turnovers, and pumpkin bars wit cream cheese frosting. All are made with farm fresh ingredients of course. The recipes do not tie exactly to what may be found on a farm in Michigan at that time of year, but that does not really matter. The recipes sound delicious! "Life's an adventure ... You have to keep your eyes open or you'll miss it." "Love isn't a game in which you give up control. It's a partnership." "Only you can decide what makes you happy." "There's always beauty to be found." "I need to be grateful for the simplest of things." "But don't live with regret, sweetheart." "We are who we are based on the history and sacrifices of all those who came before us." Regardless, the book works because sometimes we all need those reminders. At least I do. Also, the images of the Michigan countryside are serene. The idea of history and continuity passed through generations of strong women is an appealing one. Recipes and gatherings of family and friends conjure up cozy images of a warm hearth. Mind you, there are hints of seriousness with harvests lost, crops destroyed, and even the challenges faced by migrant workers. However, the heart of the story is a sweet, simple, feel good tale perfect for a summer beach read (or really a cozy fall read with cup of cider and a baked goodie in hand! ).